"Love" token, awarded by dpaola2. "Love" token, awarded by tomekj2ee. "Love" token, awarded by quiddity. "Love" token, awarded by guayosr. "Love" token, awarded by tycho.tatitscheff. Do we show it in Maniphest? Can you add it via Edit Task? How do you delete the image? 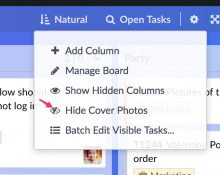 Maybe a (per-user or per-user+per-board) option to hide images (e.g., Manage Board → Hide Cover Images) if you don't like them or are doing organizational work such that they're distracting? Allow the image height to be variable? Q564: How to remove an image from a task? • guayosr added a subscriber: • guayosr. 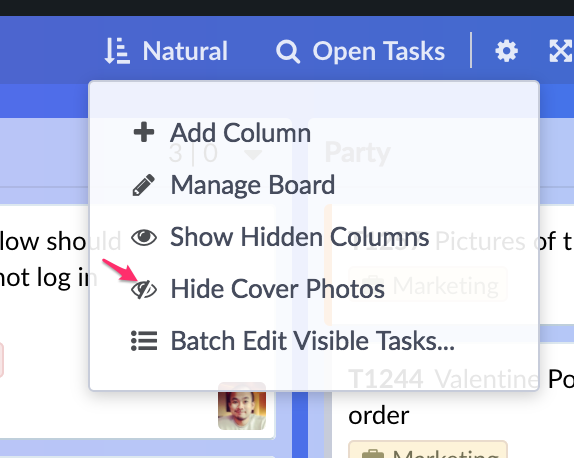 +1 to the "Maybe a (per-user or per-user+per-board) option to hide images" item in the current task description here. - Especially because some workboards can get huge, and might have a lot of CoverImages. Trello has this done quite well by listing all the image in the card's details, and have action below each to make/remove it as cover. dpaola2 added a subscriber: dpaola2. chad mentioned this in T12665: Color the whole area of a task in order to differentiate tasks under a same column. chad added a subscriber: RikiWiki. Some of this is fixed; the rest of it doesn't have outstanding customer requests.